The Target Edition of the album that I had contained two extra bonus tracks that were different from the standard Deluxe Version of the album widely available. The latter had three songs not on this edition, and this edition had two songs not available elsewhere. It’s true that “On Evil Beach” can be found on the Japanese CD but “Cinderella Ride” is, for the time being, only on the Target CD anywhere in the world. The first bonus track was a good example of the reason why B-sides existed for so long. Some songs were just too odd to sit in a coherent program. Then there are those like “On Evil Beach” that almost defy description. But I’ll try anyway. Imagine Black Lace gone dubstep. This was the strangest sound I’d ever heard from a Duran Duran song. I could easily imagine it accompanying the afternoon drinking binges by lobster-red Brits at the beachside bars of all-inclusive resorts, somewhere in the Dominican Republic. Don’t ask me how I know this. I’d rather not say. The song sounds brutally mastered; fully in the red to the point of distortion. Thankfully, the brief song ends shortly after two minutes with a shock cold ending which was much kinder than I was anticipating. “Cinderella Ride” made me scratch my head for other reasons. Namely, why on earth was this fine song not sitting on the album proper while [shudder] the likes of “Danceophobia” or “Change The Skyline” were deemed hot prospects? I love the New Order guitar line and the presence of real drums and bass here goes a long way towards sounding like a real song instead of a impoverished simulation of it. Simon sings a great melody here and Nick’s synths on the coda sound like a fine 1983 deep cut. I’d urge fans to seek out the Target Edition for this track alone. Like their peers [Simple Minds, I’m talking to you] their latest album finds Duran Duran shuffling off their stronger as well as weaker material to bonus track status. Wow. Look at that 14 year arc from 1997 to 2011. Four albums of slow, methodical progress. A rarity for this band, who wildly zig when perhaps they should have zagged. It figures that following their late-in-the-game triumph of “All You Need Is Now,” the follow up would be another Duran Disaster®. That it is not quite the debacle that “Thank You” was, is perhaps some small solace. Still, “Paper Gods” does join the middleweight chaff of DD albums best forgotten. The small triumphs that it offers overshadowed by the type of gaffes that would take down any other band. Not these guys though. They’re a resilient as cockroaches. That album bears mentioning in that I was one of the few Duran Duran fans who actually liked their 2007 album; made by Timbaland and Justin Timberlake wherein Duran Duran were reduced to guest star roles on their own album. Everything that I have heard fans say about that album I would instead direct towards this new one. Like that one, I think that DD were willing to sell themselves out as much as possible for the notion of a chart hit. As it was, I loved “Red Carpet Massacre” partially due to the material, which I felt was of a more memorable caliber than on “Paper Gods.” Primarily, I loved that album for Simon LeBon’s singing, which I have never loved. His performance there had an integrity that I felt was absolutely missing from this new album. I feel that “Paper Gods” achieves what little integrity it does have strictly by accident. I suppose five years from now DD [at 60+] will crawl back on a stage somewhere to offer a new album, and with their checkered history, it could be surprisingly good, or just as easily a new low. Never have I seen a career arc as random as theirs looks. In his comments on this thread, Echorich sounds a bit angry at this album. I can’t allow myself to get too worked up over Duran Duran. I just don’t hold them to the same standard of artistry that I expect from bands that mean much more to me from that era. It’s just not worth the effort after 34 years of seeing and hearing it all. The best songs here have a few threads of continuity running through them. Their rhythm section actually play bass guitar and drums on them. 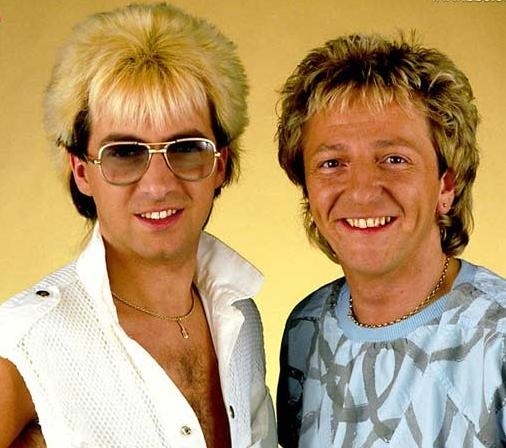 Nick Rhodes considers them one of the best rhythm sections ever. Remember that the next time your assistant is wrapped up in Pro Tools, Nick! The best songs were written by the four members of the band and guitarist Dom Brown. Allowing “hot names” to co-write waters down the DD sauce and erodes band revenue! Any song with a guest star credited in the song title [in brackets] was usually poor. Anna Ross outsung them all easily on “Butterfly Girl” with no legally mandated title credit. Lesson: get guest vocalists with talent, not hype. If you have to count on Jonas Bjerre fans for first week sales, it’s time to hang up the DD shoes. Join us in ten years for more of the Duran Duran Rock G.P.A. This entry was posted in Core Collection, New Romantic, Rock GPA and tagged 2015, Duran Duran, Rock GPA. Bookmark the permalink. Your comment about Mark Ronson making them stick to their strengths reminds me of another juggernaut that is trying to make a comeback soon – the SF Zombie known as Star Wars. I was part of a generation that abetted the monster that it has become by buying every damn licensed product in the late 70’s early 80’s and I never thought that I would say this but I really wish that franchise would die. Or be put down. C’mon, Old Yeller was given a death while he still had a shred of dignity to hold onto. J.J. Abrahms has been brought on to direct and I find him the least appealing candidate to try to save this product, if there was ever a director who needs to be brought down to earth and forced to focus on ONE IDEA, it would be this one. Whether it is Duran Duran or Star Wars eventually an entity, product, whatever you will, lands in a trap. If you make Rio part 2, Rio part 3, Rio part 4 you have fans & press that accuses you of being lazy and not trying to grow If you go and do something from a radically new direction people complain that you didn’t make Rio part 2. Really all I care about is whether or not the product is good, and, if you can’t make a good product then maybe it’s time to just retire the b(r)and. Good point Brian – I thought there were a few more. 2 outta 3 winners, but they all would have been better choices for the album IMHO. Echorich – As we see today. Brian Ware – Your wish is my command, sir! Monk, your view that Paper Gods makes me angry is pretty much on point. I don’t subscribe to the idea that AYNIN was Duran Duran 2 or Rio 2. I do agree that Ronson went in with the band with a brief that focus their joint efforts on tickling that muse that brought the band in the studio 34 years ago. I would have been disappointed by a carbon copy follow up 5 years after AYNIN, but to release an album that is basically schizophrenic and only plays on the bare minimums of these veterans’ strengths was such a missed opportunity that it just pisses me off. Echorich – I think that all of their albums are “eclectic” but yes, RCM and “Paper Gods” were “schizophrenic.” Good choice of a word. The sad thing is that you know the next album will be another five years later. I think they wrote good [if not great] material for this record. An album’s side worth of it was relegated to bonus track status. Who knows what other material was cast aside for what we got? Was my optimized version of “Paper Gods” worth the four year wait? Maybe not. It would have passed muster as a two-year follow up. But the band need to be on their game as they head into the home stretch. They are playing with their legacy, and their story, in particular, has many poor chapters. AYNIN was so strong, maybe they should have retired to Antigua afterward. If they can’t either match or surpass that achievement, then bowing out is the honorable thing to do. Black Lace gone dubstep….the horror, but strangely fascinating as a concept! Impressed you’ve even heard of them…! SimonH – Pray for me. I am an American who knows about Black Lace. Chalk it up to exposure to a friend’s copies of Smash Hits from back in the day. I believe I have a horrifying clip of the video for “Agadoo” on a Max Headroom tape somewhere. And the Duran track absolutely sounds as I described it! Agadoo….isn’t that the “Caribbean” sounding dance track that’s like the macarena without moving your hips or legs? Echorich – Bingo! It’s a musical bête noir to an entire generation of Brits! Once upon a time when I was a teenager, in an effort to annoy my younger brother, I wrote a letter to the Melody Maker letters page in his name, extolling the virtues of Black Lace – clearly something that seemed hilarious back then. They printed it and added a comment recommending he try the Electric Prunes instead…quite surreal. It felt at the time that music could fall no lower, what little we knew! Logan Sky – Yow! I find it hard to believe, but I think that you are the first reader who has submitted your own Rock G.P.A. numbers! 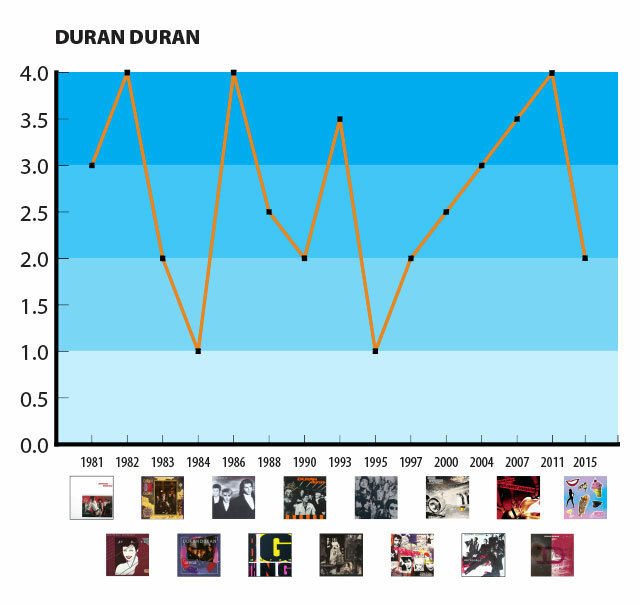 I can’t fail to notice that you broke the glass ceiling and awarded “Duran Duran” a heretofore unseen 5/4 ranking! I guess you really love the arpeggiators! I was also curious to see that you also didn’t think that “Red Carpet Massacre” was the disaster that many fans do. When I get a few minutes I will have to make a graph for inclusion in your comment. After all, with the “International Lover” EP from Riviera F, you rubbed shoulder pads with Saint Nick himself. Few of us can make such claims! Nick Rhodes has always been cool. Tim – If I were more of a “show person” I have long fantasized about creating a “Pantomime Nick Rhodes” persona where an obvious puppet of Nick Rhodes reacts with the environment around him oblivious to the fact that he is a puppet and not really Nick Rhodes. The conceit delights me and I can imagine the type of situations, dialogue, and his nasally posh voice, but would never in a million years actually be a puppeteer to make this happen. Puppetry is a form of This Business Called Show that’s only a half-rung above …magician! [shudders] Comparatively, mimes stand on both their shoulders! It’s a great idea. I wonder what the Spitting image folks did with the DD guys back in the 80’s. We had three specials here in the states but it was a series in the UK. Sharp eyed readers may notice a Twin Peaks tip of the hat in my comment….no disrespect to Mr. Rhodes, like most of DD they certainly have charisma that translated well in a video driven decade. James Hurley has always been cool. JT – So that was a paraphrase from the original Twin Peaks? Haven’t watched it in about 15 years, I suspect. My original broadcast recordings on S-VHS® format. No, it’s one of the more notorious fan-favorite quotes from the new TP. (Hurley is often disliked in TP fandom, so having a character unironically utter this line is, ironically, ironic… but was that intentional?). The Roadhouse is still around and on, what I am guessing is open mic night, James wows the crowd with a rendition of “Just You & I” (the song that he was working on 25 years earlier with Donna & Maddie). The only thing missing is the crowd waving bic lighters (“fire….wave with me.” Couldn’t resist). The re-boot is damn good, if you have absolutely any affection for the original, the movie Fire Walk With Me or Lynch it is essential viewing. This is the work of a master at the peak of his game and if you like Lynch by any measure….. when you hit episode 8 you are in for something genuinely special. Re DD, I haven’t given them money for an album since Big Thing and one of the joys of the YouTube age is being able to much easier try before you buy. I caught the clip for that “Pressure On” song and you have to hand it to them, they still have that charismatic je ne sais quoi that is just entirely complimentary to video music shorts. I think that on the first viewing I was paying more attention to the composition of the video than the song itself, they’ve all aged well, seem quite capable and Nick Rhodes is still one suave and stylish guy. And when it was done I thought, you know, that really tugged at me but it’s the nostalgia train leaving the station more than anything else. I found myself wondering, if I was a 15 year old kid and I caught that how much time would I give it. 15 seconds? 20? Probably long enough to wonder what the hell Janelle Monae is doing with these geezers before heading to the next video over to the right on YouTube. Tim – When I was 15 years old, listening to music by an OLD FOSSIL like Paul McCartney [36 at the time] seemed to be inconceivable to these ears! He was what we were reacting against. Teens listening to “Pressure Off” now would be like me listening to someone in their late 50s as a teen. And I can’t even come up with a name to analogize… because there isn’t any! I work with a millennial who buys only vinyl of music that was mostly popular in the 1970’s. I hear her talk about Cat Stevens more than anyone else, the Strokes probably second.